W5100 Ethernet Shield is an Arduino compatible ethernet shiled based on W5100 ethernet module. It has an in built slot for Micro SD card. 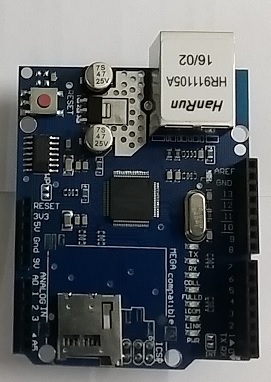 This Shield allows an Arduino board to connect to the internet. It is based on the Wiznet W5100 ethernet chip. The Wiznet W5100 provides a network (IP) stack capable of both TCP and UDP. It supports up to four simultaneous socket connections. Use the Ethernet library to write sketches which connect to the internet using the shield.